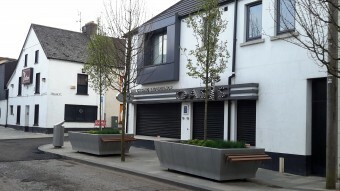 Hartecast Street Furniture products were used extensively for this major investment project in Ballymena worth £4m. We were delighted to work with The Paul Hogarth Company, Mid & East Antrim Borough Council and TAL Ltd on this scheme which will significantly enhance the public spaces and accessibility within the town centre and is expected to add new vitality as well as stimulating support from within the local community to promote more creative uses for the area. The main features incorporated in the scheme for the area which is still ongoing, was the creation of a main focal point for the town centre and public space at Broadway. Hartecast litter bins, planters and bollards were chosen by The Paul Hogarth Company to be used in this scheme.